Residential and commercial properties usually feature one or more hardscape elements in their areas such as water features, statues, paved surrounds and retaining walls. All of these were created or installed based on two important reasons. It could be due to aesthetics or functionality. But these goals can only be achieved if the people responsible in building these hardscape elements are experts in their field. North Carolina residents should not look far in searching for the right people for this difficult hardscaping job. Seasons Unlimited Inc. has professional hardscape designers who can work on all types of hardscaping projects. Our company employs a pool of creative craftsmen who have ample experiences in creating and building various hardscapes. Moreover, our craftsmen are knowledgeable on the strategic locations of hardscape elements to complement the existing softscapes. The installation of retaining walls is very practical for your property because of the many purposes it serves. It is important in retaining soil, setting a border, accentuating an area and providing seating. The presence of retaining walls in your property can make it more interesting and classy, especially if these will be constructed using pavers and natural stones. 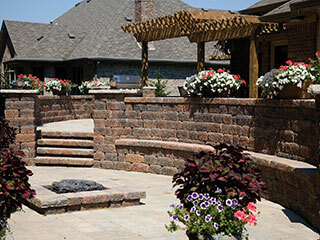 The important role of retaining walls goes hand in hand with its aesthetic appeal. Aside from protecting your property from the permeation of dirt and possible soil erosion if your property rests on a slope, retaining walls can also create a vertical effect that can undoubtedly make your property more appealing. Most often, the choice of materials for constructing retaining walls is based on aesthetics and strength. The top two choices are bricks and concrete pavers. Brick and concrete pavers are common materials for constructing retaining walls because they allow moisture to expel properly from the walls and are very easy to install. 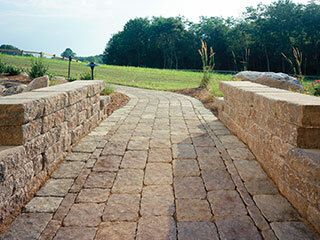 Our craftsmen can form different curves and shapes using these two types of pavers. Pavers also create a beautiful texture to the wall. This makes the pavers an ideal choice for yards. Also, both brick and concrete pavers are guaranteed to last for years without losing the kind of beauty it reflects. Don't hesitate to contact Seasons Unlimited Inc. for all your hardscaping needs. Aside from retaining walls, we can also build stunning water features like streams, waterfalls, fountains and ponds. A large landscape will surely need walkways and steps to guide your visitors to other areas. We know what materials to use in these hardscape elements. We recommend the use of natural stones and pavers to ensure that they will last for years. Our team can also create durable and functional patios. Pools will become a better area for relaxation with our beautifully designed decks. You can also ask us to install gazebos and pergolas. We guarantee that your property will never look the same after the installation of these hardscape elements. Moreover, we use quality materials like natural stones, bricks and pavers to make sure that your investment will last for decades.